Facebook traffic is down by half in the last two years. It risks dropping to third place for most-visited websites worldwide. A new study by SimilarWeb revealed the continuous slide of Facebook from around 8.5 billion in 2016 to 4.7 billion visits in July this year. While Facebook traffic dropped, YouTube surged to 4.5 billion visits last month. It will soon take Facebook’s spot to be the second-most-visited website in the world behind Google. Take note that the study separated the web traffic from Google.com and YouTube.com, a Google-owned company. Google had 15.2 billion visits last month to cement its place atop the list, as it has been over the last couple of years. At first, you may think this adds to the bad spell Facebook has been in the last few months. The social network has received complaints, left and right, over privacy concerns and its efforts to stop it. The issue spilled over its latest financial report, as stock prices continue to decline. SimilarWeb noted, however, that the decline in web traffic roots on Facebook’s mobile success, more than anything else. The research says that Facebook users have switched to mobile apps, rather than accessing the website through a browser. This is evident in the social network’s growing app usage and overall engagement. Other Facebook platforms, such as Messenger and Instagram, are growing and reinforcing their parent company’s wider appeal. Retention time on Instagram for Android is up from 27 minutes daily to 56 minutes daily, the study finds. SimilarWeb claims that stockholders have to assess Facebook as part of its broader “ecosystem”, including apps like Messenger and Instagram, and not on its own. The study adds that Facebook focuses on growing its full slate of services and not just its social network. 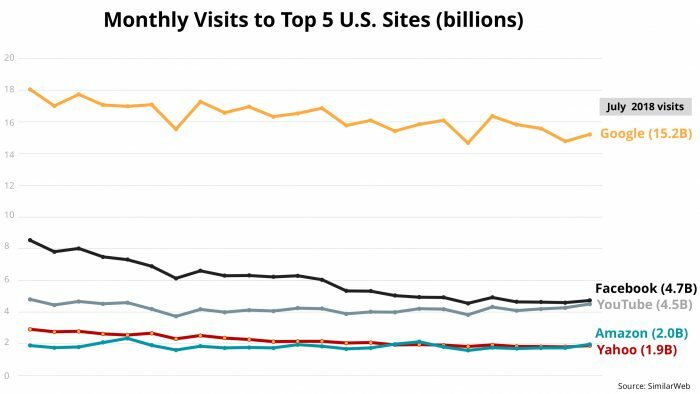 Amid the defense on Facebook, SimilarWeb predicts a shift in the world’s most-visited websites. While YouTube is set to take over Facebook’s spot, SimilarWeb also expects Amazon and its two billion monthly visits to grab the fourth spot from Yahoo. Google web traffic is down over the past two years. But it still retains a large lead, highlighting its continued dominance and the importance of search in consumer lives. The decline reflects its transition from relying solely on its website to its apps and voice search. SimilarWeb points out that the list contains four extremely successful brands—and then there’s Yahoo. Expectations over Yahoo’s reemergence have dwindled over the past decade. Though it still generates significant traffic, Yahoo.com visits dropped by a third, from about 2.9 billion to 1.9 billion.